The SOLFRUNT 1981 process gauge is available in two models; the 1981 model and the 1981 Advantage model with a dampened movement. Both process gauges read gauge pressure, and come with a solid front case and 316L stainless steel wetted surfaces with a seamless bourdon tube for longer life. The 1981 Advantage dampened movement option provides users with some of the benefits liquid filled gauges, without the risk of the fill fluid leaking. These process gauges have a PET turret style case for chemical and petrochemical processing applications. The PET material gives this case superior impact strength and a broad spectrum of chemical resistance. They are available dry, with a dampened movement, or liquid filled with an EZ Fill case. The EZ Fill case is designed to facilitate filling in the field without special tools. 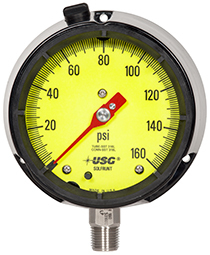 The 1981 and 1981 Advantage process gauges are supplied in 26 vacuum, compound, and pressure ranges from 30" Hg vacuum through 11600 psi gauge pressure. Dual scale dials are available for every range. Order Code: 17...X or 27...X - The EZ Fill case is available for all 1981 gauges, allowing the end-user to liquid fill the gauge in the field, without any special parts or equipment. Just pull the fill plug and fill with your fill fluid to create your own liquid filled pressure gauge. Order Code: /YB for dial & /RP for pointer - High visibility bright yellow dial and red pointer make your pressure gauge easier to read in any lighting, during the day or at night with a flash light. Order Code: /LUM - The dial is wrapped in a rechargeable, durable, “glow-in-the-dark” vinyl formulated by 3MTM. This film recharges with as little as three minutes of exposure to sunlight, fluorescent, or incandescent light, but longer exposure will improve performance. Glow-in-the-Dark dials provide users with improved visibility for gauges that need to be checked at night, or in low light situations.